I used to write about teaching my daughter to write quite often. But in the end it became stressful – it felt like I was forcing it rather than teaching her to enjoy it. So I stepped back and left her to lead what we did – and she didn’t choose to write. I had to trust that she would come back to it when she was ready. And now she is. In the past three weeks she has got interested again. It started with her campaign about people dropping rubbish,which she made posters for. 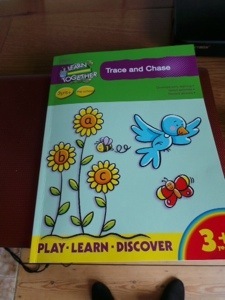 But since she seemed interested, I got her a phonics book for pre schoolers, with writing and activities. And we’ve built it back into the daily routine, in a relaxed way. 1. Rosie goes for her nap. 2. We get out the writing book (only if Amelia wants to though). 3 we do one page together at the table. 4. We find the stickers for each page when it is finished. 5. After the page, we will either do some colouring or writing in an exercise book. It’s enjoyable, and a real pleasure to see Amelia taking an interest. 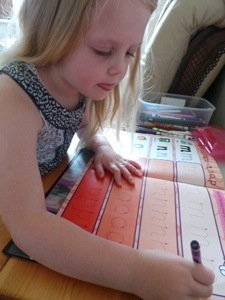 She recognises almost all letters now, and now can write a fair few too. It only takes 10-20 minutes at most, but it’s something that we both are really enjoying at the moment. For me, it’s also bittersweet since I am very aware that I lose my afternoons with her in September. It already feels like a loss – I am so very envious of those who are able to homeschool as it is a dream I wish I could pursue but am not brave enough to take the risk. 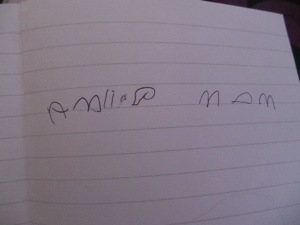 Today she wrote ‘Amlia (love heart shape) mam.’ All by herself – I had no idea what she was writing. 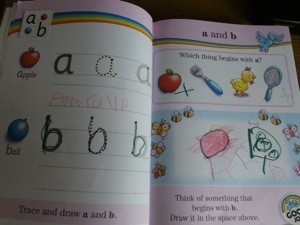 She practised a bit (on every page of an exercise book!) by herself but got there in the end. I was so very proud of her, and it made me smile a lot. I keep looking at this little bit of writing, and it makes me want to cry because it’s just so lovely. 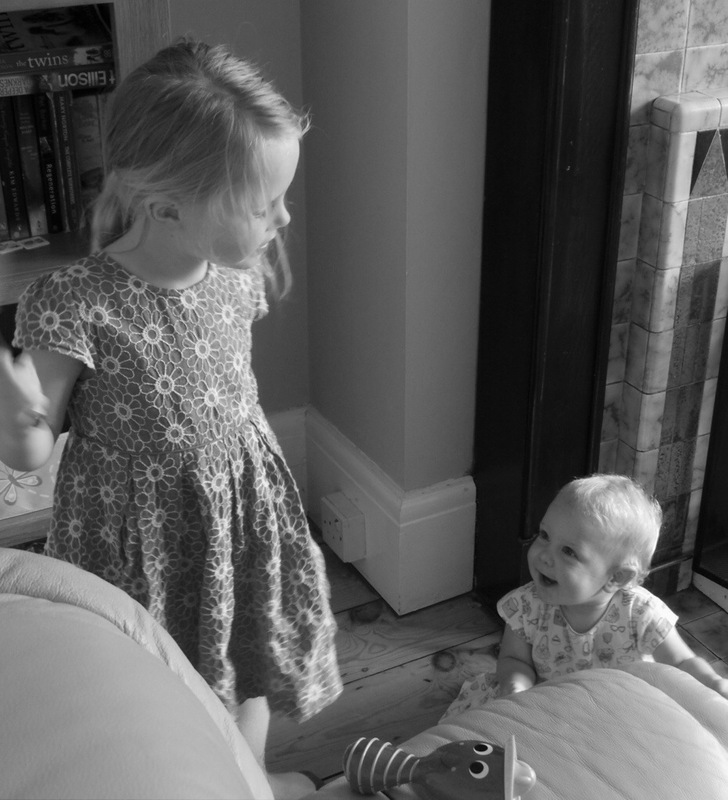 I have joined in with http://www.mummydaddyandmemakesthree.co.uk – a wonderful linky about remembering the ordinary moments. I have decided to start to write a weekly letter to you both. For the future. I found myself thinking about why I blog, and the simple answer is, I blog because I want to let you both know that you are loved, and that we had fun times together. So that’s exactly what I’m going to do! This week has been a fun week my little ones. I had the week off work, which was brilliant. I’ve got to have some fun times with the two of you. On Monday you wasn’t very well Amelia – you had been up though the night with back ache – this is an ongoing concern as you mention it every day. So we went to the doctors. We met a friendly doctor, and were with him almost an hour! He checked everything, and it seems that you are getting over a water infection. But I have to take you for a blood test to be sure. I haven’t told you that part yet as you do worry about injections. It’s not for 3 weeks so I’ll worry you about it nearer the time. On Tuesday we went swimming as a family. After nursery we had lunch, then went to the swimming pool. It was such good fun – you both loved it! Amelia, you are so strong at swimming now – something has clicked and you are now confident and happy in the water, and are starting to swim well. Rosie, you loved it in the water. I often feel bad that I don’t take you as much as I did your sister, but in the water you are like a little water baby. You screech with excitement, kick your legs and actually almost swim! You had so much fun chasing the little toys, and ‘jumping in’ from the side of the pool. Wednesday and Thursday were lazy ish days – we played a bit of Lego, made some frogs (this was entirely your idea Amelia, and you decided on what you needed to make them, and did a good job). On Wednesday I saw your big school for the first time. You weren’t with us. I was impressed – reception seems lovely with a nice big classroom, a lovely outdoor area just for reception, and a small classroom for a quieter group activity. Lots of your nursery friends will be moving up with you and I think and hope that you will be happy there. You go tomorrow for a play visit with your nannie so I hope that you love it. I want so much for you to enjoy life my girl. On Friday we went to the woods for a walk. I took a picnic, and we ate on a picnic bench then played on the park – Rosie you love the slide at the park, and giggle loads when I help you to go down it. We walked round the woods, found a ‘secret field’, looked at what flowers we could find using your flower book and enjoyed the time out together. Saturday was spend gardening, and you slept at Sarah’s Amelia (and loved it – woke up at half 5 in the morning apparently!) I think auntie sarah is tired today! Today we had a lovely time at nana and grandads. Grandad billy did a BBQ, with a bit of all sorts – mackerel, mussels (these got a mixed reception – amlelia, you announced that they smelled disgusting). And prawns, chicken skewers and burgers etc. I got a bit carried away with the water pistols Amelia, and got you quite a bit (and grandad!) nana Rosie was there too, she loves seeing you both. 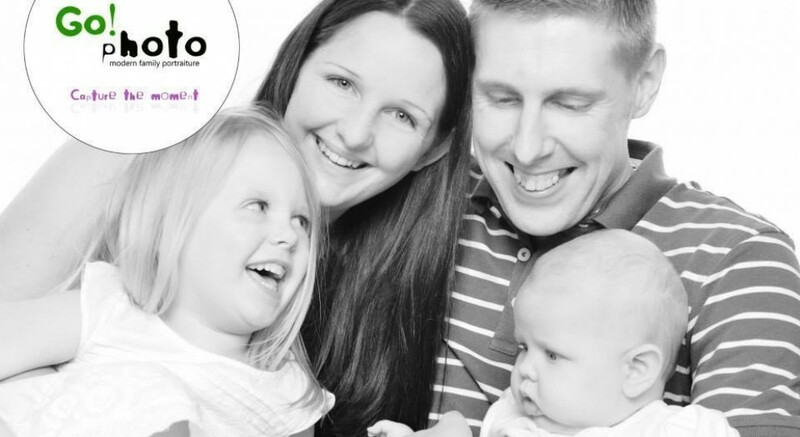 We all had a lot of fun – Amelia, you especially enjoyed using your powers to make sure the BBQ produced lots of smoke, and Rosie you enjoyed pottering about p, throwing your food to the dogs (you are fascinated by them) and having a snooze on the sofa for an hour. It was a nice day together. Rosie, you are wonderful. You are walking. Everywhere this week – getting yourself standing from anywhere – dad thinks you walk like ET (in a cute way if course)! And you kind of do, it’s lovely. And you were pretend crying with me yesterday – you laugh when I pretend to cry and then do it back. You have been speaking to us a lot this week – making new sounds and learning more every day. I love standing back and watching the two of you play together – you sometimes have a quiet moment when you both play the same thing – maybe shaking the instruments, or playing ‘tig’ (too long to explain this game!) but I love standing and watching you both giggle together and bond.